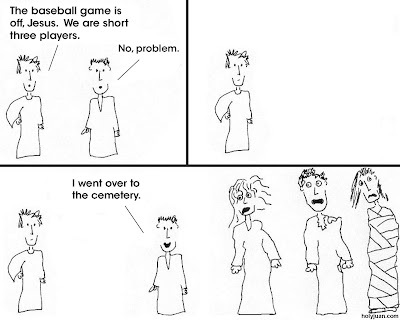 HolyJuan: Young Jesus: Play Ball! one of your captions if a little off. Good catch! That'll teach me to edit comics at 2:00am. Hey, why are these zombies so much bigger than Jesus and his friend? Are you trying to say that any old zombie you dig up in average joe graveyard, usa is bigger and better than your lord and savior Jesus Christ? This is outrageous. Or are the zombies just closer to our vantage point (and your drawing are crappy)? 1. This is Young Jesus, so he's smaller than your average dead adult. 2. My drawings are crappy. It's a selling point. ok, good point. next time I'll read it. I read the bible once and found it a little too hard to believe. I mean, why is jesus speaking english? Jesus speaks English because Klingon was not invented yet. Revelations is far better in the original Klingon. Four ktzingra of the k'pocalypse!